We knew T-Mobile would have to say something today as the Simple Choice pricing question lingers for Apple’s new devices. Well, it’s only some good news as the press release just arrived with no surprises and unfortunately no Simple Choice pricing details. We know that the iPhone 5C will be available for pre-order on September 13th and both devices will arrive on September 20th. As of today, there’s no sign of a pre-order for the iPhone 5S. T-Mobile’s press release highlights Simple Choice pricing and JUMP!, but doesn’t make any mention of how much the devices will cost with equipment installment plans. It’s really pretty disappointing to announce that you will carry the next-gen Apple devices without so much as a mention over Simple Choice pricing. Given how important the no-contract offering is to T-Mobile’s platform and with the knowledge that this is the first time T-Mobile will carry iPhone devices right from their sales start date…I imagined pricing would available. We can make some pretty educated guesses at how much T-Mobile will want down on the iPhone 5C with the 16GB model priced at $549 and the 32GB model priced at $649. The iPhone 5S in 16/32/64GB variants will cost $649/$749/$849 respectively. It seems likely the iPhone 5S will carry the same pricing as the iPhone 5 does today, $145.99 down and $21 per month for 24 months. I’m also thinking the iPhone 5C could run $99.99 down and $15 a month or something thereabouts. I hope we find out exactly what T-Mobile has in-store price wise in the very near future. I’ve pinged T-Mobile for any information on pricing and will update this post as soon as they respond. T-Mobile today announced it will offer iPhone 5s, the most forward-thinking smartphone in the world, and iPhone 5c, the most colorful iPhone yet, to customers beginning on Friday, September 20. iPhone 5c will be available for pre-order on Friday, September 13. Customers may pre-register interest today at t-mobile.com For more information on iPhone, please visit: www.apple.com/iphone. As you know, T-Mobile is differentiating itself with outstanding wireless experiences built on its dramatically simple no annual service contract Simple Choice Plan for unlimited talk, text and Web, its well-regarded JUMP! early upgrade program and a blazing-fast network. The Un-Carrier promise has really struck a chord, because customers need a wireless company who is on their side, and willing to change all of the rules. Our Q2 earnings demonstrate the momentum we have in the market. We reported significant growth in T-Mobile’s total and branded customer base in the second quarter due to successful execution of our Un-carrier strategy. · The Simple Choice Plan starts with a base rate of $50 per month for unlimited talk, text and Web with 500MB of high-speed data. Customers can get 2.5GB of high-speed data for $10 more per month per line or unlimited data for an additional $20 per month per line. Customers can add a second phone line for $30 per month, and each additional line is just $10 per month. No caps. No overages. No restrictive annual service contracts. · JUMP! offers the freedom to upgrade to a new device more frequently and affordably, and it includes handset protection that helps to protect against malfunction, damage, loss or theft – all for just $10 per month, per phone (plus taxes and fees). · In addition, T-Mobile is offering a fast nationwide 4G and expanding 4G LTE network. As of early August, T-Mobile’s 4G LTE network reached 167 million people in 116 metro areas across the United States. T-Mobile is also the only U.S. wireless provider offering nationwide HD Voice for crystal-clear calling on many of the smartphones it offers. The Un-carrier strategy and customer response to it has uniquely positioned us in the wireless market. People especially love the freedom from service contracts, and the flexibility to upgrade when they want. We’ve been pleasantly surprised by the customer passion for these topics. And we don’t plan to rest one bit. In fact, we plan to raise the bar again with “Un-Carrier 3.0” this fall. Perhaps T-Mobile will surprise us with temporary promotional pricing (like they did when they first sold the iPhone in April)????? Will tmobile still sell the remaining iPhone 5 they have in stock? I wonder if they will reduce the price? They are gonna run their stock, and that will be it. This is what they are doing with the Galaxy Note 2 right now, no more shipments since the Note 3 is less than a month away. They’re already running out on the web site, so I’m guessing they just stopped ordering more 5 models as today was approaching. So, you already know the time of availability, specs and pricing on the next Nexus? Care to provide some links? Specs were leaked through the FCC documents. Heck, there’s an article on this very site recently about it. If it’s gone through the FCC then it’s coming out very soon. The only thing we don’t know is the price but the last Nexus was $350 for 16GB. A lot of assumptions there. No guarantee Google would price the Nexus at 350. If they did, it’d be even more reason for them to market the phone to the mass market, not just to developers & techies. Imagine a commercial directly comparing features & PRICE against an iphone. How you can be so sure when the Moto-X was just released, google owns it and has a price tag of $599? I expected a much larger price difference but at the same time – it is Apple we’re talking about here. Corporate arrogance and abuse of loyalty! It was definitely a dumb move by apple. What was the point of the 5C. 550 for a phone in emerging markets is not going to sell well. If that is the price they were going for, then they should have just stuck with the 5. They would have made more money, since they would not have had to develop the design and invested in new manufacturing. Also keeping the 4S over the 5 was dumb in my eyes, since it is still using the 30pin and does not have LTE. I agree with you. 400-450 price range would have sold like hotcakes. I think this move ended up getting approved by investors who did not want to trade sales for profit margins. It’s all about the profit margins. Apple will probably make a ton of profit off the cheaper plastic used in the 5C compared with how much the 5 costs to manufacture. Disappointed that it’s priced so high. They didn’t pass any of the reduced production costs on to consumers. I partially do not agree. I think they will have huge profit margins, but I do not believe this will make huge profits, because the price is making it a competitor to the iPhone 5s and will not likely convince the people who pick up free android phones to switch to this. If apple made this free on contract, I could see it stealing some lower end market shares that android controls, but at 99 dollars, I think people will just up for the 199 iPhone 5s with better camera and fingerprint reader. The 5C is the midrange phone, the 4S is the bottom of the range. The people writing about the 5C before the event got it wrong. I don’t blame Apple for that. Apple changed the looks of their midrange model. Now people walking into an Apple Store will have an easy time seeing the difference between the three levels of iPhone: Aluminum, Plastic, or smaller screen. Next year I expect there will be a new high end phone in aluminum, a midrange phone in colored plastic, and a low end phone in black and white plastic. Apple can just move the current 5S chassis into plastic, and only offer the 5C in black and white plastic. Simple, and easy for people to understand when they walk into a store. Cheap to make because you can keep making the same chassis for three years with no changes, and keep making the plastic cases for two years. Those three things were Apple’s goal in releasing the 5C, I think. The 16GB is $549. $100 off your price. Goodie Gum drops. Oh wait? I don’t use Apple. …yet you took the time to post a meaningless comment. so, tmo went for this $hite instead of the moto-x ? Your guess on money down/monthly has to be wrong. If 5s retail is $649 and 5c retail is $549, then the amount paid over the 24 months is going to be a $100 difference. The way you have it, it’d be $194 difference. If you use the basis as 5s at $146+$21/mo, then the 5c could be $99+$19/mo. $650 for a “low cost” iPhone? No thanks. Im glad Apple sees that as budget friendly. If you are gonna pony up that kind of cash, why not just get the 5s or an Android device that will toast it and cost less. The 5S is 650, while the 5C is 550, but your point still stands. No point in getting this over the 5S. The 5S has the better camera, processor, and fingerprint reader. Apple fudged up a golden opportunity by making it 550 instead of 450. How is this going to sell better than a 5 in emerging markets. At least the 5 looks like the new model. Not to mention apple wants to target android users. Wont happen with this price structure for cheap made in china plastic. Agree. Why would anyone pay 550 for this when their are plenty of low end Android options to choose from, plus the 350 Nexus( assuming it stays the same price)? 450 would have put it in the ball park, and I believe many would have paid the extra 100 for the apple experience. I do not see the 5C being the answer to the emerging market question or the new smartphone users who just want a phone that does facebook and text/calling. This of course means more people in the Android ecosystem. Exactly because almost all android phones are made of cheap made in china plastic. Apple never said that they would make a “budget” iPhone. The Interwebs decided that. Why the 5C? There were far too many people buying the 4S (at a lower price with the same cost to manufacture) instead of the 5. The 5C is a lower cost to manufacture than the 5 (due to the plastic shell). Now people can buy either phone at approximately the same margin for Apple as the 5S. Win-win for Apple. 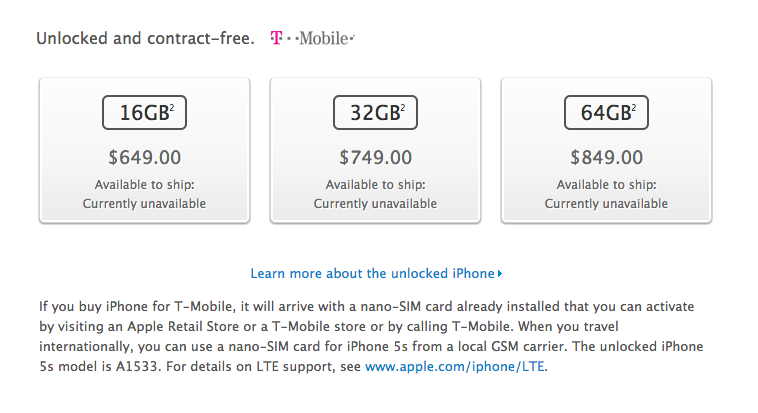 But will T-Mobile stores be carrying the 32 and 64 GB iPhone 5S models for the launch?? I know the stores currently only house 16GB models and you have to online order anything larger than that… Important questions! any word of wifi calling? Yes between any two iPhones (a part of iOS 7), but sadly no app from T-Mo yet to allow calling to or from any other phone…. – I expected a much lower price for the 5C. Around $450 max. Looks like Apple made it for the sole purpose of increasing their margins rather than trying to gain marketshare. Their profits will probably be astronomical this quarter. – Wi-Fi Calling? No info on this yet? – Will T-Mobile get their heads out of their behinds and offer something other than 16GB in store like the rest of the carriers this time around? – How will the remaining iPhone 5 stock be priced? – Is the 5S available for preorder on the 13th as well? It’s likely that since Apple is not offering pre-orders for the 5S, carriers will not, as well (my presumption). 1. Will T-mo stores offer 32/64gb 5s models? 2. 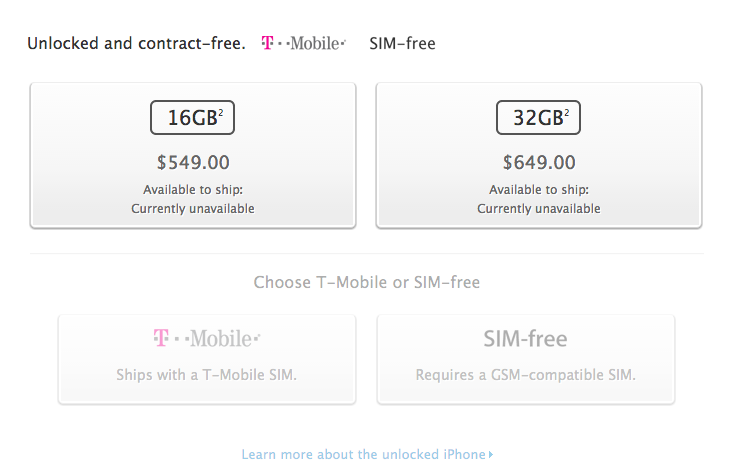 Will Apple/T-mo stores offer a payment plan for the 5s? not for the 5S, only on the 5C. I will by mine using my Discover Card through Shop Discover. 5% cash back plus an additional 5% cash back if purchased Oct-Dec.
How is any of this fake? I think that you live in another planet because today was official the announcement of the famously rumored iphone 5c and 5s. It seems to me that the smarter move would have been the rumored original plans. Make the 5 the mid option & give the 5C the innards of the 4S making it the low end option. They could have priced it at $399 or $450, while getting rid of the 30-pin connector & the old screen resolution in one swoop. It seems to me that they screwed this one up a bit. They don’t care about that man. 4S innards in a new model would be a step backwards, as iOS 7 won’t run as smooth as on the 5C with the A6 chip. That’s obvious. The point is that is they would be able to kill three birds with one stone. All in good time, its more than likely this is the last year the 4S/30 Pin will be available, so it’s almost phased out. Next year all iPhone models will be lightening. Might as well continue the trend like they’ve done one more time. Next year will be the (presumed) redesigned iPhone 6, woot! Yeah, but that’s what they’ve done each of the last few times. The 4S ate into 5 sales & the 4 ate into 4S sales. That’s just the nature of the beast. Not everyone is going to buy the latest option. $145.99/Down + $21/Month for 5S sound most realistic, with $100 more for higher GBs. For 5C, $69.99~$79.99 + $20/Month. And turning 4S into $0 Down. I’m completely fine with that. I just wanna know that these models will be available at the T-mo stores on launch day.. with any kind of down payment pricing scheme. Where does this leave the iphone 5? Will it be priced the same as the 5s? I mean will it be priced the same as the 5c? No, the iPhone 5 will be discontinued. It will no longer be available. They’re selling the 4S, the 5C, and the 5S. The 5C is basically the same phone as the 5, it just has a different case and a slightly better battery. Are you sure? Chat representatives on the website are still currently reporting that they cannot confirm 5s devices will be able to be pre-ordered on Friday. Theres no pre order on the iphone 5s it come out on sep20 you have to go to the store only the iphone 5c i avialable for pre order on friday. 1- Can you get a 64GB 5S at the Apple store with the payment plan? 2- Will T-Mobile stores carry the 32/64GB models and not just the 16GB 5S? Because that will be a decision of going to Apple and paying upwards of $900 to get the 64GB 5S for T-mo verse going to the T-mo store and getting it for something like $200 down w/ a pay plan. In the past, the Apple store has not been able to accommodate T-Mobile’s EIP payments. Apple used to offer a line of credit for T-Mobile iPhone purchases. I don’t know if this is still the case. Yeah I just spoke with a rep on the site, they said down payment plans would be available. But I don’t think they will be taking pre-orders for the 5S, only the 5C. But I guess we will find out soon. This actually seems pretty accurate, unless thay are going for more down and less gradual pay, but this can actually happen. Tmo generally aims for a $20-$25/month for their high end smartphones. Despite what Apple may say, $549 is high end. Xmiro’s guess of $69 + $20×24 is in line with other TMo phones. I see the following GSM models on the apple website..which is the correct one for tmo network? 5C: A1532 for T-Mo, ATT, and interestingly VZ. 5S: A1533 for the same three. Nice that the same hardware will run on all three networks anyone would want to use! Too bad I can’t JUMP! ’till January. I would’ve picked up a 5S as soon as it is available. The iphone 5c is not a cheap phone at all. When I got the 5 back in April, it was a total of $580 ($100 down + $20/month for 24 months). I guess Apple doesn’t know the meaning of the words budget or low-cost. I would just go for the 5s instead of the 5c. The phone is 649, 749 and 849 regardless of how you pay for it. Also android phones are just about as costly. An unlocked Galaxy S4 is $649. Not sure why anyone would think a smart phone is cheap. I am under-whelmed at the pricing. T-Mobile should do some aggressive initial pricing with the 5C and 5S like they did when they first got the iPhone 5. $99/$0 upfront would wreak havoc on the other carriers. I’m not sure Apple will allow their brand new flagship to be sold for so little though. Apple seems to have some silly restrictions in place concerning how its phones are sold… I’ve always wondered why they cared so much — they’d get their money either way! $99/$0 would be just awesome…. T-Mo obviously did $99 for the 5, so there’s hope. Well, you got your wish. $0 & $99 down. Let the havoc begin! Any word on if or when there will be wifi calling on the iphones? I want that so bad… iOS 7 includes WiFi calling from iPhone to iPhone, but not to or from any other phone. Not sure if Apple has to enable that functionality (not likely they would), or if T-Mo could just build an app, which should work since there are plenty of other WiFi calling apps that behave just like the built-in “Phone” app out there.